Badgers? Badger cubs, to be precise. DH went out cycling with his best friend on Monday night. 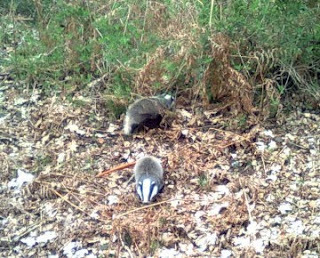 Came home with the news that they’d spotted two badger cubs. As in wild ones, in the scrubby bit bordering the cycle path. He’d taken a video (which he says I am not allowed to upload to the net, bah humbug – but what I can tell you is that when badger cubs chatter to each other it sounds like six-year-old girls having a fit of the giggles) and also took a couple of snaps before their mum called them and off they trotted. 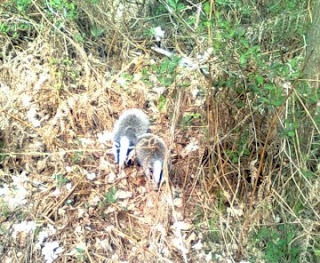 He did say I can post the pics here (well, hey, how often do you see pictures of badger cubs in the wild? And hmmm, there’s a lightbulb), so here they are (including a close-up). Other than that, what have I been up to? I had to switch over Monday and Tuesday this week to accommodate a meeting, so it was guitar on Monday (aka chilling out with a bit of Gershwin) and visiting Dad (not the best of visits, sigh). Tuesday started brilliantly with an unexpected email that put a huge smile on my face (and no, I can’t share yet, but I will as soon as I can). Then it was the annual SEN meeting, which went very well indeed and I’m pleased with the outcome; and then in the evening I had an interview with a local journalist as well as doing a talk at the library in Holt. 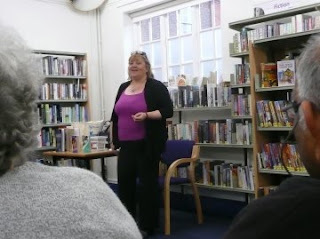 Alan from the library service was an utter sweetheart and took some pics for me – so this is me in action. Today - the plan was to nip into town and do some admin (aka bank run, buy a new mouse mat and SD card, then nip into John Lewis and talk to them about netbooks), but that was all scuppered when school rang. Cue the entire morning spent in A&E with son. He’s fine, but the wait was pretty tedious. Maybe this is a sign that I should NOT buy a netbook… I was starving (that’ll teach me to have my breakfast before the school run in future rather than after) but, the second I sat down to eat, the doorbell went. (Postie with German translations.) And when I sat down again, the doorbell went again - this time the Green Party. It’s also parents’ evening today. Son, bless him, got me a bunch of appointments together at the beginning, another at the end, and one smack dab in the middle; given that I've already spent several hours waiting today, I think I’m coming home in between appointments! 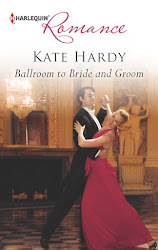 And tomorrow… Tomorrow, I will knuckle down and start the new book properly. Thanks for sharing everything about your trip to Venice! I wanted to mention it yesterday, but time got away from me. So interesting and filled with the historical trivia I love. Sorry you had such an exhausting finish, but I was a kid who traveled a lot with my parents and I remember those "exciting" parts very fondly. 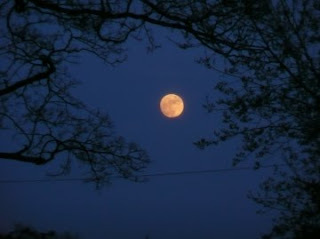 Absolutely love the moon picture, Kate. Right there with you on The Highwayman! And the badger cubs - how cute! 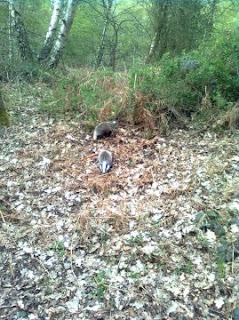 Many years ago when we lived in Somerset we used to visit a sett regularly. The cubs were gorgeous, wandering around our feet and trying to steal our shoelaces! Those badgers are just so cute! It would be amazing to see them up close! Hope you make it through parent's evening! Jill - glad you enjoyed it the pics (and the historical trivia). I think we're all already beginning to remember it as an adventure instead of being cold, tired and hungry! 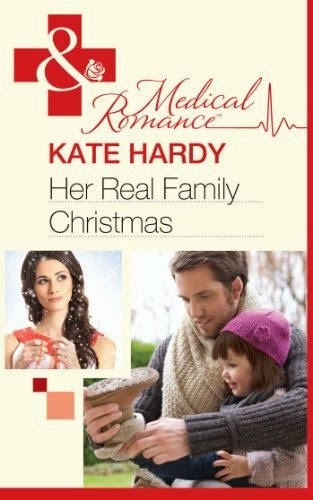 Lacey - mm, I'm looking forward to it! And thanks, we did survive parents' evening! Aw, I love those badger pics. We have them nearby but, although I've seen the adults late at night, I haven't seen the cubs. I keep looking though. Writers and poetry - I agree, it's a love of language.